We've included these beaches for you: Waikiki Beach and Kailua Beach Park. 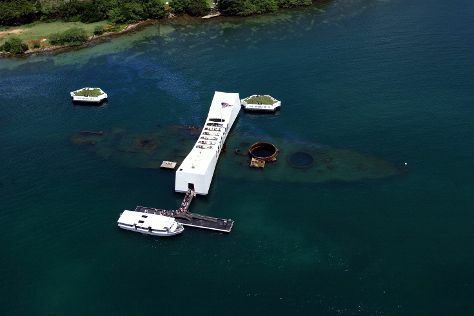 Do some cultural sightseeing at USS Arizona Memorial and USS Bowfin Submarine Museum & Park. The adventure continues: take in the pleasant sights at Diamond Head State Monument, take in the dramatic scenery at Manoa Falls, and explore the activities along Hanauma Bay Nature Preserve. To find where to stay, traveler tips, and tourist information, read our Honolulu sightseeing website . Sydney, Australia to Honolulu is an approximately 13-hour flight. The time zone changes from Australian Eastern Standard Time (New South Wales) to Hawaii Standard Time, which is usually a -20 hour difference. In June, Honolulu is warmer than Sydney - with highs of 35°C and lows of 27°C. Finish your sightseeing early on the 3rd (Wed) to allow enough time to travel to Seattle. Kick off your visit on the 4th (Thu): examine the collection at The Museum of Flight, then kick back and relax at Alki Beach, then shop like a local with Chihuly Garden and Glass, and finally stop by Elliott Bay Book Company. 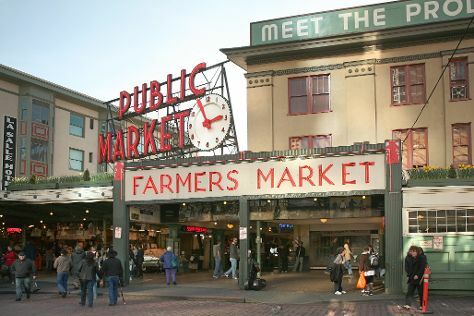 On your second day here, take a stroll through Pioneer Square, take a stroll through Pike Place Market, and then take in panoramic vistas at Space Needle. To see more things to do, ratings, and more tourist information, read our Seattle trip planner. Traveling by flight from Honolulu to Seattle takes 8 hours. Due to the time zone difference, you'll lose 2 hours traveling from Honolulu to Seattle. Plan for slightly colder temperatures traveling from Honolulu in June, with highs in Seattle at 27°C and lows at 16°C. Wrap up your sightseeing on the 5th (Fri) to allow time to travel to Yellowstone National Park. Get in touch with nature at Mount Washburn and Fairy Falls. Spend the 9th (Tue) exploring nature at Yellowstone National Park. Spend the 10th (Wed) surrounded by wildlife at Grand Teton. 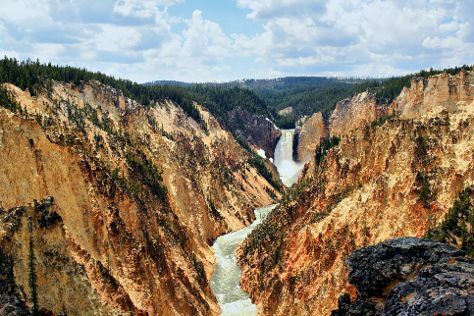 There's lots more to do: take in breathtaking views at Grand Canyon of the Yellowstone, trek along Artist Point, and take in the natural beauty of Old Faithful. To find ratings, more things to do, other places to visit, and other tourist information, you can read our Yellowstone National Park travel planner . Traveling by combination of flight and car from Seattle to Yellowstone National Park takes 5.5 hours. Alternatively, you can do a combination of flight, shuttle, and bus; or drive. Traveling from Seattle to Yellowstone National Park, you'll lose 1 hour due to the time zone difference. When traveling from Seattle in June, plan for a bit cooler days and colder nights in Yellowstone National Park: temperatures range from 22°C by day to 1°C at night. Finish your sightseeing early on the 10th (Wed) so you can travel to New York City. Get some historical perspective at 9/11 Memorial and Cathedral Church of Saint John the Divine. The Metropolitan Museum of Art and Ellis Island are good opportunities to explore the local culture. There's still lots to do: explore and take pictures at Central Park, get a new perspective on nature at American Museum of Natural History, see the interesting displays at New York Public Library, and make a trip to Statue of Liberty National Monument. To see photos, traveler tips, other places to visit, and more tourist information, use the New York City tour site . Getting from Yellowstone National Park to New York City by combination of car, flight, and bus takes about 9 hours. Other options: do a combination of bus, shuttle, and flight; or drive. The time zone difference moving from Mountain Standard Time (MST) to Eastern Standard Time (EST) is 2 hours. When traveling from Yellowstone National Park in June, plan for somewhat warmer days in New York City, with highs around 31°C, while nights are much warmer with lows around 21°C. Finish your sightseeing early on the 15th (Mon) so you can travel to Key West. On the 16th (Tue), examine the collection at The Ernest Hemingway Home and Museum, identify plant and animal life at Key West Butterfly & Nature Conservatory, then view the masterpieces at Alan S. Maltz Gallery, and finally find your balance on the water with some of the best stand-up paddleboarding in the area. Get ready for a full day of sightseeing on the 17th (Wed): explore the galleries of Truman Little White House, then immerse yourself in nature at Fort Zachary Taylor, and then see the vivid underwater world at Western Dry Rocks. For ratings, reviews, maps, and other tourist information, refer to the Key West trip itinerary maker . Traveling by combination of bus and flight from New York City to Key West takes 6 hours. Alternatively, you can fly; or drive. Traveling from New York City in June, expect Key West to be a bit warmer, temps between 36°C and 30°C. Cap off your sightseeing on the 17th (Wed) early enough to travel to Miami Beach. 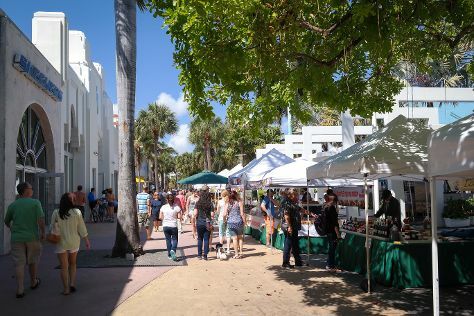 Start off your visit on the 18th (Thu): tour the pleasant surroundings at South Beach, then get to know the fascinating history of Art Deco Historic District, then get a taste of the local shopping with Lincoln Road, and finally take a stroll through Collins Avenue. On your second day here, enjoy the sand and surf at Haulover Beach Park, then get a taste of the local shopping with Aventura Mall, and then immerse yourself in nature at Oleta River State Park. To find reviews, other places to visit, where to stay, and more tourist information, go to the Miami Beach online driving holiday planner . You can fly from Key West to Miami Beach in 3 hours. Other options are to drive; or take a bus. In June, daytime highs in Miami Beach are 37°C, while nighttime lows are 29°C. Finish up your sightseeing early on the 19th (Fri) so you can travel to New Orleans. Start off your visit on the 20th (Sat): take in the spiritual surroundings of St. Louis Cathedral, then examine the collection at The National WWII Museum, and then get to know the fascinating history of Garden District. Here are some ideas for day two: see the interesting displays at Audubon Butterfly Garden and Insectarium, then get to know the fascinating history of Jackson Square, then appreciate the extensive heritage of French Quarter, and finally get a taste of the local shopping with Royal Street. Inspirock's itinerary builder makes planning a New Orleans trip simple and quick. You can fly from Miami Beach to New Orleans in 4.5 hours. Other options are to do a combination of bus and flight; or drive. Due to the time zone difference, you'll gain 1 hour traveling from Miami Beach to New Orleans. While traveling from Miami Beach, expect a bit cooler days and somewhat warmer nights in New Orleans, ranging from highs of 33°C to lows of 33°C. Wrap up your sightseeing on the 21st (Sun) to allow time to travel to Grand Canyon National Park. Get outdoors at Rim Trail and South Kaibab Trail. On the 23rd (Tue), hike the day away at Bright Angel Trail. The adventure continues: take in breathtaking views at Grand Canyon South Rim, take some stellar pictures from Powell Point, cruise along East Rim Drive, and stroll through North Kaibab Trail. To see where to stay, photos, more things to do, and more tourist information, use the Grand Canyon National Park trip planner. Traveling by combination of flight and bus from New Orleans to Grand Canyon National Park takes 10.5 hours. Alternatively, you can do a combination of flight and shuttle; or drive. You'll gain 1 hour traveling from New Orleans to Grand Canyon National Park due to the time zone difference. Expect cooler evenings in Grand Canyon National Park when traveling from New Orleans in June, with lows around 6°C. Finish up your sightseeing early on the 26th (Fri) so you can travel to Las Vegas. Do some cultural sightseeing at The Strip and The Mob Museum. Get outdoors at Red Rock Canyon National Conservation Area and Valley of Fire State Park. There's still lots to do: make a trip to Bellagio Fountains, try to win big at Bellagio Hotel and Casino, buy something for everyone on your list at The Grand Canal Shoppes at The Venetian, and admire the natural beauty at Bellagio Conservatory & Botanical Gardens. To see reviews, where to stay, maps, and tourist information, go to the Las Vegas trip maker website . Traveling by combination of flight and car from Grand Canyon National Park to Las Vegas takes 4.5 hours. Alternatively, you can drive; or take a shuttle. Traveling from Grand Canyon National Park to Las Vegas, you'll gain 1 hour due to the time zone difference. While traveling from Grand Canyon National Park, expect a bit warmer days and much warmer nights in Las Vegas, ranging from highs of 46°C to lows of 29°C. Finish your sightseeing early on the 29th (Mon) to allow enough time to travel to San Francisco. Head to Union Square and Ferry Building Marketplacefor plenty of shopping. Escape the urban bustle at Alcatraz Island and Muir Woods National Monument. Change things up with a short trip to Modus Operandi Cellars in St. Helena (about 1h 30 min away). Next up on the itinerary: take in the pleasant sights at Fisherman's Wharf, steep yourself in history at SS Jeremiah O'Brien, wander the streets of SoMa, and take your sightseeing to a higher altitude at Twin Peaks. To find maps, other places to visit, where to stay, and tourist information, go to the San Francisco trip planning app . You can fly from Las Vegas to San Francisco in 4 hours. Another option is to drive. Traveling from Las Vegas in June, expect San Francisco to be much colder, temps between 25°C and 15°C. Wrap up your sightseeing on the 3rd (Fri) to allow time to drive to Yosemite National Park. 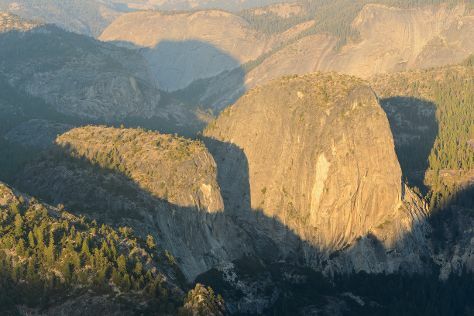 Step out of the city life by going to Glacier Point and Tuolumne Meadows. Spend the 5th (Sun) exploring nature at Elizabeth Lake, Yosemite National Park. And it doesn't end there: hike along Mariposa Grove of Giant Sequoias, admire the sheer force of Vernal Fall, get great views at Valley View, and stroll through Panorama Trail. To see more things to do, ratings, other places to visit, and other tourist information, read Yosemite National Park holiday planner. You can drive from San Francisco to Yosemite National Park in 4 hours. Other options are to do a combination of flight and car; or do a combination of flight and bus. Traveling from San Francisco in July, you will find days in Yosemite National Park are a bit warmer (33°C), and nights are slightly colder (9°C). On the 9th (Thu), you're off tohome.